Kakao Friends Corp., a character licensing arm under South Korea's top mobile messenger operator Kakao Corp., said Wednesday it has decided to change its name to Kakao IX after merging with JOH, a brand consulting firm, earlier this month. Kakao IX said its new name stands for "Innovative Experience," explaining that the title reflects the company's vision of providing new experiences to clients in their everyday lives. The company holds license over Kakao Friends, a group of popular characters used for emojis of KakaoTalk, by far the most popular mobile messenger in the country. The application boasts more than 40 million users in South Korea. 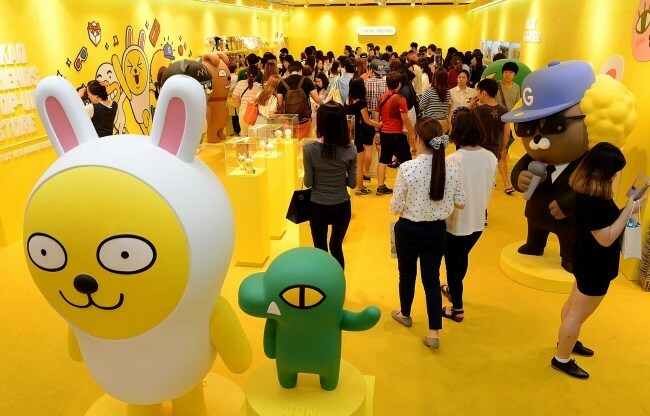 Kakao IX said it plans to upgrade its two flagship character stores in southern and northern Seoul, which attract around 7 million visitors annually, from conventional gift shops to venues where users can enjoy various cultural experiences. Over the second half of 2018, Kakao IX said it will also push to make inroads into overseas markets, including Japan, China, and Europe.